(b) . 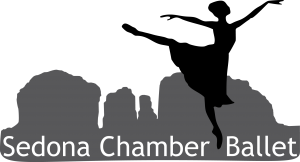 The Sedona Chamber Ballet Company will challenge the accepted definition of a traditional pre- professional ballet company, preferring instead to be a chamber group that explores a wide range of repertoire. Through an innovative strategy involving artistic collaborations, alternative forms of presentation and educational outreach within Sedona and the surrounds, SYCB will maximize its artistic and financial resources in the service of the community . Maintain a classical two-act Nutcracker ballet production and continue to provide other performance opportunities throughout the year, regularly commissioning new works to enhance the program. Providing the opportunity for students to participate in high quality performances is crucial for the success of ballet dancers. Performance opportunities enable students to broaden their levels of technique, improve self-confidence, focus and discipline, and learn about theater craft. Sedona Youth Chamber Ballet’s performances also provide professional development opportunities for staff, strengthen the Company’s relationship with the community at large, and solidify the parent and donor base. •	Refine and refurbish parts of Sedona Youth Chamber Ballet’s Nutcracker to ensure a continuous process of tailoring and crafting the performance to the skills of the current students and to increase audience interest. This may include such elements as new choreography, updated sets and costumes and collaboration with other Companies. •	Evaluate the need for other artistic initiatives as they are deemed to fit the overall program objectives – examples of such performances currently being planned are Coppelia, La Sylphide Sleeping Beauty, Giselle, The Fairy Doll, La fille mal gardée, Esmeralda and a Ballet History Program. Adapt each year’s summer program to the then current needs of the students and faculty. Sedona Youth Chamber Ballet’s summer session enables students to maintain and improve technique and gives them additional performance and creative opportunities. The program also provides professional development for current staff by introducing guest teachers and choreographers, which infuses new methods and dance idioms into the students’ training. •	A summer performance in quality and scope to encourage and inspire young and mid-level students. •	A student choreographic workshop. •	Summer concerts in different venues. •	A formal teacher-training program, available to other programs, based on the Sedona Youth Chamber Ballet training syllabus. The Sedona Chamber Ballet has the need for volunteers for the live Nutcracker Performance on December 1 and 2 at the Sedona Performing Arts Center. We are in need of ushers, boutique sales staff, concessions and back stage assistance. Please call Winnie at 928 554 4059 or email sedonachamberballet@gmail.com or go directly to https://signup.com/client/invitation2/secure/2515653/false#/invitation to choose a spot. Thank you. The Sedona Chamber Ballet needs help with costumes. We need to borrow a serger for 4-6 weeks to make costumes for the ballet. We also need able seamstress to help sew the costumes. Thank you. Please email sedonachamberballet@gmail.com with your contact information.